Learn how to make cornbread from scratch. Since we know how much everybody loves homemade cornbread, we decided to put together a page that covers how cornbread from every angle. We generally eat sweet cornbread, so that's what I shared below... since that's the kind of cornbread we like. If you don't like yours sweet, simply take out the sugar or syrup in the recipe and make it without. The finished product is delicious both ways. Combine all your dry ingredients. Add the eggs, milk and oil and mix well. Pour into a well greased 8 or 9 inch baking dish and bake for about 25-30 minutes. Combine the cornmeal, baking powder, baking soda, sugar and salt. Set aside. Mix soy milk, egg replacer and oil. Combine with cornmeal mixture and mix well. Pour batter into a well greased baking dish and bake for about 20-25 minutes or until golden brown. Mix milk, egg replacer and oil. Combine with cornmeal mixture and mix well. Combine the cornmeal, baking powder, baking soda and salt. Set aside. Stir in the maple syrup and pour batter into a well greased baking dish and bake for about 20-25 minutes or until golden brown. Try stirring in one or more of these tasty ingredients and serve up a fiesta style cornbread with your meal. 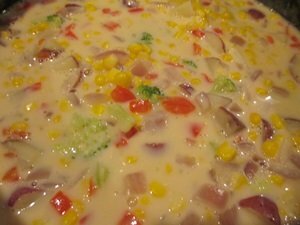 Cut a few veggie dogs into pieces and mix them, along with about 1/2 to 1 cup cheese (or soy cheese) for a veggie corn dog casserole the kids will go crazy for. Call me old fashioned but I love to have cornbread with a nice hot bowl of vegetarian chili, brown beans or homemade soup or chowder. Homemade cornbread stuffing is always a must at our holiday gatherings. And no one makes it better than Grandma. Vegetarian meatloaf is another great meal to serve with cornbread, pretty much anything containing beans, any thick and 'meaty' type casseroles, as well as comfort foods of just about any kind. There are certain foods that go with everything. Cornbread, for us, is one of those foods. I, At least, could eat with almost anything. To help you find new ways to enjoy a good old-fashioned favorite, here are some of my favorite recipes to eat with homemade cornbreaad! It's also pretty darn tasty in place of buns in our barbecue sandwich recipe. Just cook up the filling, spoon it over fresh baked cornbread and serve! Or serve it alongside a hearty vegetarian shepherds pie recipe.